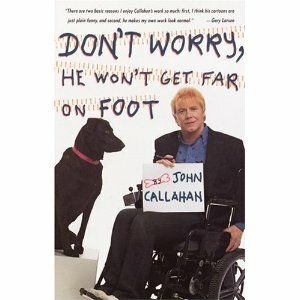 John Callahan was perhaps combining comics & medicine before just about anyone. This book, published in 1989, is mostly text, but includes many of Callahan’s health-related single panel gags. It also includes his story of alchoholism, traumatic injury, rehab, and life as a paraplegic who made comics. Callahan died in 2010. There’s a theoretical asterisk to his work in all of his obituaries, and might also be found when discussing it in terms of Graphic Medicine (which I have never seen done) and I’m curious to explore it. Callahan’s work generally remained on the periphery of mainstream acceptance due to its dark humor, often labeled inappropriate, or later and more damning, politically incorrect. I’m wondering today if others who make comics on medical themes were influenced by Callahan. Andrew Godfrey has cited Callahan in presentations. Politically incorrect or not, I feel as if I gained some insight into the experience of living with a physical disability from reading Callahan’s work, and this book. Comics have a long, proud history of being inappropriate, as wonderfully displayed in the Rude Britannia exhibit at the Tate Modern. I’m curious, as the field of Graphic Medicine gains interest in academia and the general public, how this history (and propensity) will be impacted. It’s not explicitly medically themed, but this book has always been a favorite.